"My experience with Doctor Gumbs was excellent!" "Dr. Gumbs was absolutely amazing." Dr. Joslyn Gumbs is a leading OBGYN in the Greater Los Angeles, CA, area, dedicated to helping women of all ages, from teens to seniors, get the skilled care they need to be as healthy as possible throughout every stage of life. Her experience, advanced training and compassionate approach have earned her the confidence of all her patients and made her a favorite healthcare provider among L.A.-area women. Dr. Gumbs completed a Bachelor's degree in chemistry at the University of Manitoba, followed by a second Bachelor's degree and certification in cytology (cells) at Loma Linda University. She earned her M.D. at the University of California, Davis, where she garnered multiple honors, and completed her residency at White Memorial Medical Center. 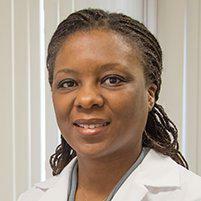 In addition to being certified by the American Board of Obstetrics and Gynecology, Dr. Gumbs also been certified by the International Academy of Cytology and the American Society of Clinical Pathologists, and she's a member of the American Medical Association and the American College of Obstetrics and Gynecology. Throughout her career, Dr. Gumbs has remained committed to providing the most advanced and safest care for every patient, carefully crafting an individual plan of care for each woman she treats. Her commitment to learning new techniques and technology ensures she can provide top-quality care based on the most current information. Welcome to our office! Dr. Gumbs is recognized as a leading gynecologist in the Los Angeles area, providing patients with the comprehensive range of general gynecology services they need to stay healthy. From health screenings and exams to diagnosis and management of medical issues, Dr. Gumbs provides passionate, confidential care. Hollywood Presbyterian Medical Center is an acute-care facility that has been caring for the Hollywood community and surrounding areas since 1924. The hospital is committed to serving local multicultural communities with quality medical and nursing care. With more than 500 physicians representing virtually every specialty, Hollywood Presbyterian Medical Center is ready to serve your medical needs and those of your loved ones and strives to distinguish itself as a leading healthcare provider, recognized for providing quality, innovative care in a compassionate manner. "Fantastic bedside manner, little wait time and she indulges me with my ridiculous questions without judgement. I kind of just want to go back to hang with her." "Awesome doctor! Im a first time mommy and my experience through out my pregnancy was great! You are in good hands with Dr. Gumbs!" "There was no wait time...I loved her personality and she answered all of my questions. She even thought of some follow ups and took initiative on my ongoing treatment."